A big Thank You to all REGUA supporters! 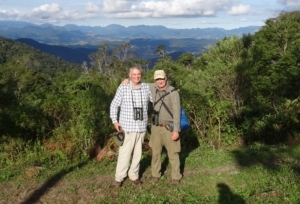 REGUA welcomed retired RSPB director Stuart Housden and Alan Martin recently. Although Stuart is familiar with the project and had visited REGUA before, he is now a Brazilian Atlantic Rainforest Trust (BART) Trustee and the aim of the visit was to learn what REGUA does; why its work is so valuable and how he could help us with his vast experience. It is amazing to think that we started this off in 2001 with a plan to protect a part of the Atlantic Rainforest at REGUA and almost two decades later, this project is attracting international and national attention for progress in all of its programmes, be it in administration, protection, research, education, restoration or tourism. REGUA’s location is privileged in that it is set in an area that still retains a significant amount of original biodiversity. It is also just close enough to Rio de Janeiro city and its environs to make a day outing, an overnight stay or longer visit easily viable. The factors that contribute to the biodiversity are various including; area of remaining forest cover, a forested gradient and fundamentally an understanding local community, be it land owners, farmers or the local population. We started our conservation programmes 20 years ago with international support as funding within Brazil was virtually non-existent. Today we see the fruit of what we planted and the results today of every programme speak for themself. Possibly the best thing about REGUA is that there are so many things to do, it has an exciting aura around it as ever more people are visiting and we can show positive results. The forests are returning the hillsides and valley, the biodiversity is improving, more land is put into set aside, more visitors and the community are learning and approving of our actions and we are getting bolder with our convictions. So, although Raquel and I are getting older, we are keener than ever to gain improved results. Through sharing experiences and knowledge, your visit helps us stride firmly towards the future. A huge thank you to our UK volunteers, Lee, Rachel, Sue, and to Alan for having been champion king pin for so many years, and now Stuart who together with our mother charity BART and its Trustees endorse our actions and want to help us reach further towards the future. On both sides of the Atlantic, we have marvellous teams and Raquel and I can firmly say that your determined support has made the difference! 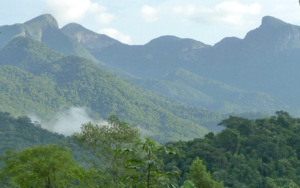 REGUA has been working with Wildscreen, the award-winning film-making conservation charity, to produce a short film about our work in the Atlantic Forest of south-east Brazil. Experienced producer and film-maker Verity White of Five Films, visited REGUA in March 2015 to capture some wonderful images, and comedian and presenter Michael Palin will provide the narration. The film shows the beauty of the forest and its wildlife, and features some of the people that continue to make REGUA one of the very best conservation projects in South America. Verity White had been in Brazil as a student and loves the country and its people. She filmed most of the people who are vital to the success of the project including the rangers, tree nursery staff, the ladies who look after our visiting volunteers and guests, REGUA’s visitors and bird guide, research students as well as the local children who visit under our Young Rangers programme and schools outreach programme. Thumbs up and excited cartwheels along the forest trails were all captured! Verity would wake as early as possible to do time lapse sequences from the observation tower showing the clouds forming from the forests. One early morning she even saw a puma slink back into the forest! Early dawn sequences with parting mists and rising sun bathing the Guapiaçu valley in glorious light and tropical colours. Of course the drone was the highlight and the aerial filming of forests provided for perspectives rarely seen. 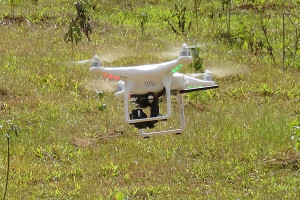 With perfect weather, cloudless cool mornings, the drone could hover, tilt and slowly climb providing just magical footage of REGUA’s protected forests, the tree planting campaign and even dense verdant valleys that had never been filmed before. Verity left us with a taster of the film that left us breathless and we cannot wait to see the final cut version that gives a glimpse into the magic which makes this project such a wonderful success. The finished film is due for release in April 2015.